Made to order for the discerning player and collector who is looking for a tailor made, elegant and highly unique instrument of the highest standard. Our first aim is to produce guitars that sound and feel exceptional. They must instantly transport the player and the listener to a dimension of pure sonic joy. 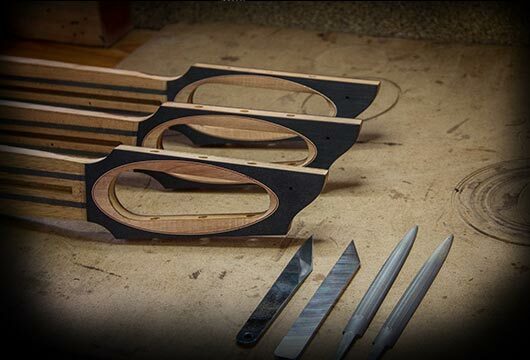 Our second aim is to produce guitars that look as good as they sound and feel. 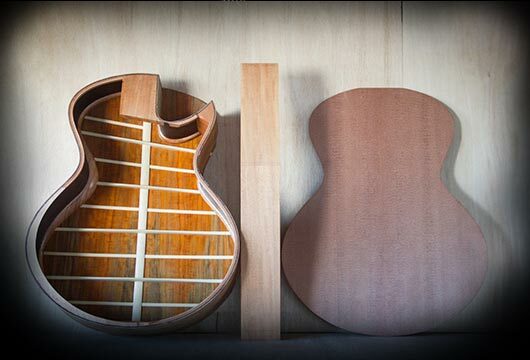 To achieve this, we use only the very best available materials and every aspect of our guitars is hand-made. No computers or CNC machines are used. Since no machine can practice and polish its art, we believe in keeping them where they belong, In the factory, producing things by the batch. We build a maximum of eight instruments a year, affording ourselves the opportunity to focus individually on each one. 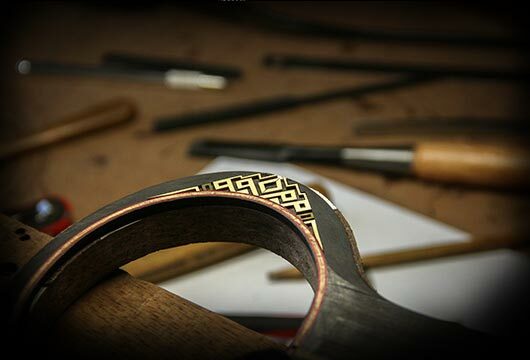 Every Casimi guitar that leaves our workshop has undergone three months of meticulous hand crafting, voicing and customisation until it is as close to perfect as we can possibly make it. Looking at the details you will find some of our innovations. Our mitre-less purflings along with our magnetic bridge system and hollow headstock are proprietary Casimi designs. 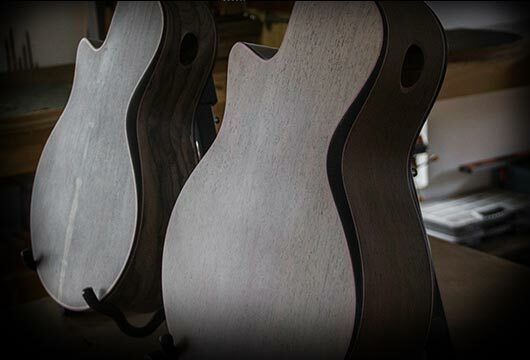 They represent the most visible part of what makes Casimi guitars as unique as they are. However everything from the overall body shape, to the internal construction has been developed from the ground up to give the best possible playing and listening experience. We offer a range of six different models. Each available in variety of Five A exotic tone woods with a selection of signature features and personal touches. These can be added to upgrade and customise your chosen guitar, making it completely unique, tailor made, just for you. Any of these models can be upgraded with any or all of our signature features. Were the full set of signature features is added, the guitar will acquire an “S” in its model number. Hence a fully upgraded C2 becomes a C2S. All these models are also available as fan fret variants. This version acquires an “F” So a full signature fan fret C2 would be a C2SF. Resurrecting fallen trees and bringing them back to life is a privilege of the first order. They have yielded one of the most versatile materials known to man. Strong, pliable, resonant and beautiful. Giants grown from seeds that once sequestered carbon, held down mountains, housed colonies of animals, breathed out oxygen and regulated entire echo systems. Their beauty transformed in our workshop from leafy wonder worlds to singing sculptures. We do our best to honour them and give them the best voice we can by carefully honing every detail of these instruments. Cutting, fitting, and voicing them by hand and ear until we know we have done our utmost to make them as close to perfect as we can. Building them by hand gives us the opportunity to treat every piece of timber according to its unique properties and match it correctly with other timbers that complement it. The aesthetic style we have developed is a visual representation of our philosophy. Each line and plain, blends into the next, just as it does in nature. 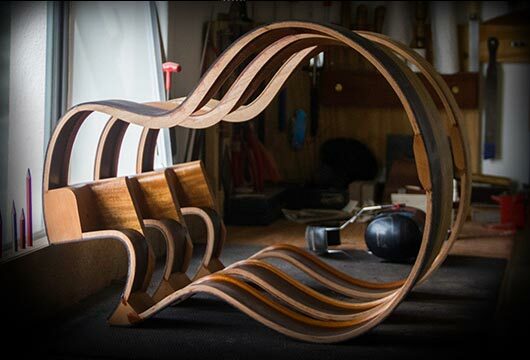 The size and shape of each component has been honed for hours, sometimes years to refine its relationship to all the others. Our aesthetic principals are founded on what we see in the natural world as the most sacred laws of the physical universe. Gravity, mass, inertia, momentum, and flow, (which is the relationship of all these to each other.) To look deeply into the ways that nature establishes form in the living world reveals that all organic form is built out of flow. The blood flows in the embryo and builds the chambers of the heart from sediments that are deposited along the lines of its flow and condensed into living tissue. The sap flows in the seed and pushes it upwards slowly building the tree from the materials it gathers on its journey from soil to leaf. The circulation of living beings mirrors river deltas that form from the tinniest of drops flowing together, gaining mass and momentum, depositing nutrients and sediments that build arteries and river beds, bringing life to every cell and pasture. This flow is always recognisable if you look for it. Always going from the microcosm to the macrocosm and back again. Breathing always. The signature of life. The Casimi shapes are a homage to that formative flow of life and the formative flow of sound that is music. They are in a sense, sculptures of music as much as they are musical sculptures. Both form and function are present and essential to each aspect including the sound ultimately produced. This also finds expression in the science behind our sound. The ellipse, parabola and hyperbola are expressions of these forces in nature (mass, inertia, momentum, and flow) and our designs are based on these three moving shapes. Research has shown that an ellipse has two focal points where an object ricocheting inside it, will always return to the same point it was launched from. 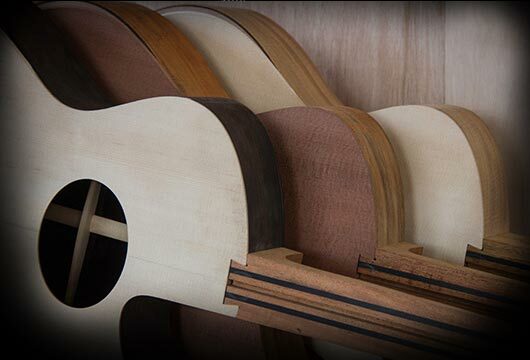 Our Casimi body shape is based on the ellipse and our guitars are designed so that the vibrations conducted by the bridge from the strings into the sound board, will be focused towards the sound hole and thus gain maximum projection. In nature, form follows function more perfectly than any man made creation. We hope to come a little closer to this great unison and hopefully contribute something of value to the guitar as an evolving instrument along the way.